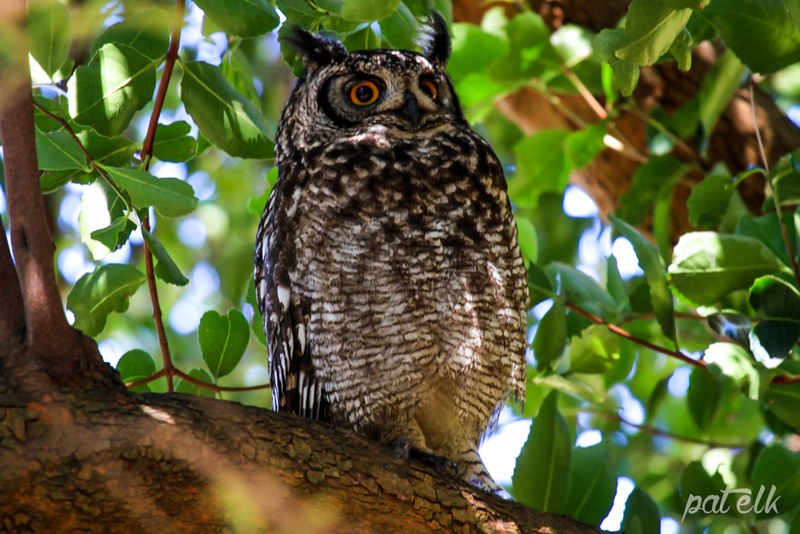 The Spotted Eagle Owl (Afrikaans name, Gevlekte Ooruil) is the most common big owl in Southern Africa. The Male is a bit smaller than the female and he is usually sitting in a tree overlooking the female and chicks. We have been lucky to observe two families relatively close, one pair very close at Kirstenbosch Botanic Gardens and the other pair a bit further away at Strandfontein Sewage Works. The Juveniles are very entertaining with their tricks and adventuring, every time you visit Kirstenbosch you will have to search in the garden beds to find them. The chicks are all fluffily and completely dependant on the adults for food and warmth. It is amazing that even with so many tourists around this pair at the Kirstenbosch Gardens breed behind the same rock, every year, with no fear of all the noise around them or the attention that they get. We have been so privileged to watch them and see them grow.